Flights throughout the West, as well as to and from the West, could be delayed Wednesday morning, after a communications failure at a Federal Aviation Administration control facility forced some airports in the West to hold flights on the ground Tuesday afternoon. In some cases, the delays were for more than three hours, authorities said. However, many passengers were stuck overnight at western airports, seeking rides Wednesday to their Tuesday destinations, while planes may be at the wrong airports for Wednesday's schedule. The radio outage occurred at the Los Angeles Air Route Traffic Control Center in Palmdale, in the desert north of Los Angeles, which controls airspace in California and parts of Nevada, FAA spokeswoman Laura Brown said. 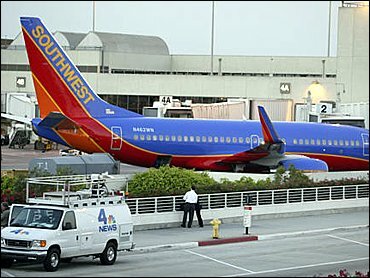 She said planes were grounded at airports in the Los Angeles region, including those in Orange and San Diego counties, as well as in Las Vegas. Air traffic controllers could monitor the planes on radar but were not able to communicate with them, Brown said. Pilots were forced to switch to a different radio frequency to communicate with other control facilities, she said. At LAX, there were a lot of people going nowhere, reports CBS News Correspondent Steve Futterman. "I walked downstairs and they said no flights were leaving," said one passenger. Stranded passengers had to make adjustments, finding a place to stay, or calling friends and family, telling them not to come to the airport. "My dog and my husband are waiting for me," said another stranded traveler. Control of the airspace was turned over to other air traffic control facilities, including one in Albuquerque, N.M.
"We want to stress there are no safety issues, just delays, because control over the air space has been turned over to other air traffic facilities," said Gaby Pacheco, spokeswoman for Los Angeles International Airport. The outage was repaired about 8 p.m. — nearly three-and-a-half hours after it began — and all airports resumed regular operations, said Cyndy Johnson, spokeswoman for the Oakland International Airport, where about two dozen flights were delayed. All flights at San Francisco International Airport destined for Southern California were grounded, said airport spokesman Mike McCarron. The airport's duty manager, Dennis Neves, said three planes bound for Southern California were diverted to the airport: passenger flights from London and Seattle and a cargo flight from Alaska.